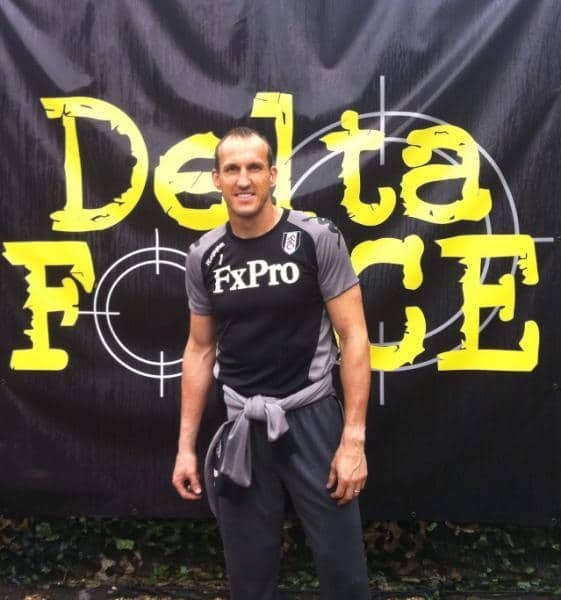 Fulham FC Play Paintball At Delta Force In Surrey! Over the weekend, Delta Force’s flagship paintball centre in Surrey hosted a day of paintball for none other than Fulham FC. The guys came down to our Surrey paintball centre as part of a series of team building exercises and according to the centre manager, the marshalling staff and the guys themselves, everyone had a great day out, despite the unseasonable weather! The guys decided on an Oldies vs. Young Fellas team split for the day which kept everyone in high spirits. Things were pretty neck and neck all day but in the end the Oldies won, much to the disgust of the Young Fellas! Since Delta Force first started back in 1989, we’ve hosted countless paintball events for all sorts of high profile sports teams including Manchester United FC, the McLaren Formula One team, the London Irish Rugby team and Chelsea FC to name a few. Given the team-based focus of paintball, a day of paintball at a Delta Force centre is the perfect team building activity and an excellent way to strengthen bonds within a team. Booking a day at Delta Force Paintball couldn’t be easier; simply give our booking office a call on 0844 477 5050 and one of our friendly booking staff will be standing by ready to tailor a day of paintball to match your requirements.